In this section you will learn about some basic operations on a mesh that OpenMesh already provides. Comprising the flipping of edges in a triangle mesh as well as collapsing edges by joining the two adjacent vertices. Considering two adjacent faces of a triangle mesh, there exist exactly two different configurations of the inner edge. Calling the function OpenMesh::TriConnectivity::flip(EdgeHandle _eh) will flip the specified edge to its opposite orientation as shown in the illustration below. // vertex vhandle and vhandle. // The edge now connects vertex vhandle and vhandle. 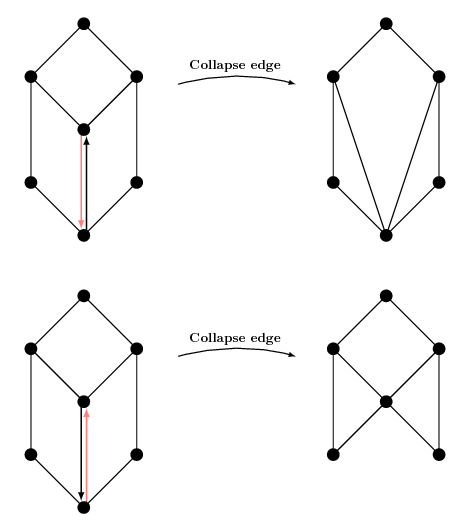 In this section you will learn how to collapse edges such that the two adjacent vertices join. OpenMesh provides the function OpenMesh::PolyConnectivity::collapse(HalfedgeHandle _heh) to perform this operation. This will collapse the from-vertex (remeber that halfedges are directed) to the to-vertex of the halfedge as illustrated below. Note that collapsing edges might cause topological inconsistencies to your mesh. You should verify consistency after collapsing edges by calling OpenMesh::PolyConnectivity::is_collapse_ok(). You have to request status attributes in order to use the collapse and delete functions! Collapsing will always be performed in the direction the halfedge points to. // Our mesh now looks like in the illustration above after the collapsing.